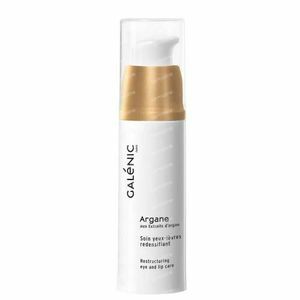 Galénic Argane Eye-Lip Care 15 ml order online. With its light, delicate texture, Restructuring Eye and Lip Care protects, smoothes and redensifies the eye contour and plumps the lips. Using a gentle patting motion, apply daily in the morning and/or at night to the eye contour area and smooth up to the brow bone, avoiding the upper eyelid. Gently apply to the contours of the lips. WATER (AQUA). CAPRYLIC/CAPRIC TRIGLYCERIDE. PENTYLENE GLYCOL. BUTYLENE GLYCOL. MINERAL OIL (PARAFFINUM LIQUIDUM). SUCROSE DISTEARATE. ARGANIA SPINOSA KERNEL OIL. ETHYLHEXYL PALMITATE. SQUALANE. SUCROSE STEARATE. DIMETHICONE. PEG-12. AMMONIUM ACRYLOYL. DIMETHYLTAURATE/VP COPOLYMER. BETA-SITOSTEROL. BUTYLPARABEN. ETHYLPARABEN. FRAGRANCE (PARFUM). HYDROLYZED VEGETABLE PROTEIN. ISOBUTYLPARABEN. METHYLPARABEN. PHENOXYETHANOL. PROPYLPARABEN. SODIUM ACETATE. SODIUM POLYACRYLATE. TOCOPHEROL. TOCOPHERYL ACETATE. YELLOW 5 (CI 19140). YELLOW 6 (CI 15985).